Case Study: Justifying the Prototype Die | KLH Industries Inc.
Of course, forming dies are not exactly innovations to the manufacturing industry. 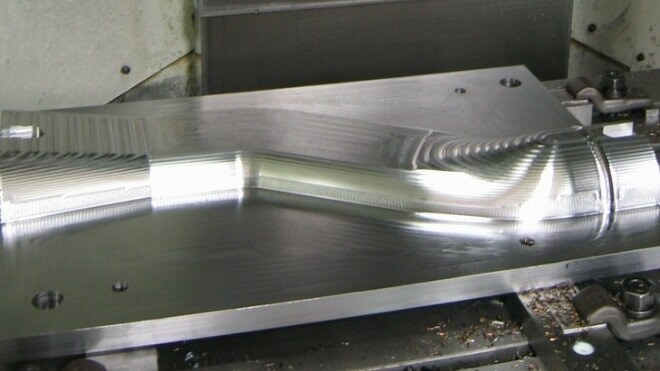 Forming dies for a total of eight pieces, however, are a bit uncommon. This unique criterion pushed KLH to take a "low" approach: low cost, low hours, and low risk. Fortunately, the customer had already engineered a solid model of the finished part, which reduced engineering time for KLH's Project Engineer, who instead only had to design tooling around the preexisting model. From there, the Project Engineer worked closely with both the CNC technician and the certified heat-treating vendor. By utilizing multiple avenues of experience, the group settled upon a hardness of 40-42 RC. Not long into machining, the operator knew the die was a suitable hardness. Using a form die not only freed scheduling time for the customer, but also virtually eliminated any lead time or labor cost associated with follow up pieces. By seeking CNC milling services over hand fabrication, the customer was able to produce near-identical prototype parts for less than the cost of hand fabrication.